BOOM! Studios Makes Comic Book History With Unannounced Landmark Comic Book Launch In Just Seven Days! LOS ANGELES, CA (April 9, 2019) – In a historic move, BOOM! 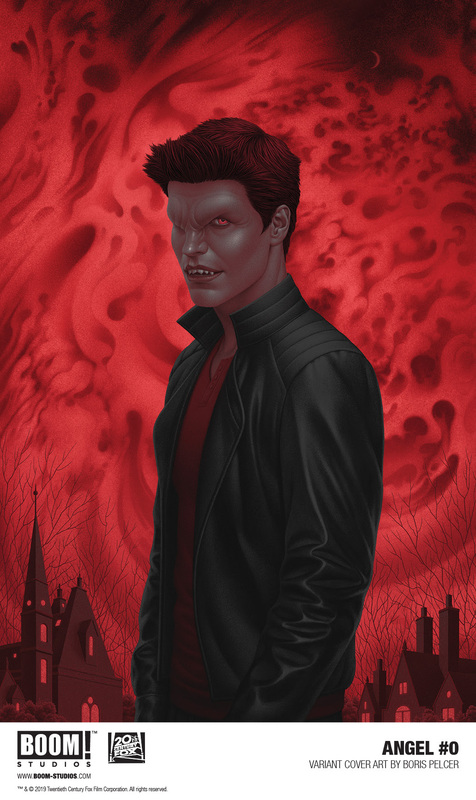 Studios, in partnership with 20th Century Fox Consumer Products, today announced the first surprise series drop in the company’s history – ANGEL #0 will arrive exclusively at local comic shops worldwide on Wednesday, April 17th! Though comic books are traditionally announced and solicited to retailers months in advance of release, the existence of ANGEL was kept a closely guarded secret by BOOM! Studios to create a true surprise drop that is 100% exclusive to local comic shops around the world (with no immediate digital distribution for two weeks). 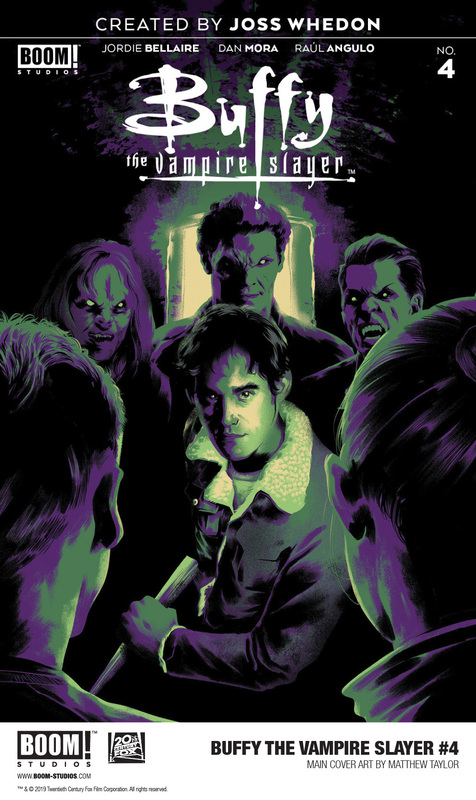 In order to meet expected fan demand, the first printing of ANGEL #0 will be shipped in equal quantities to the hotly anticipated release of Buffy The Vampire Slayer #4, which features the first appearance of the iconic vampire with a soul. ANGEL #0 kicks off an all new monthly comic book series reimagining of the titular character in all new stories from the very beginning, with the all-star creative team of acclaimed writer Bryan Edward Hill (Batman, American Carnage) and Gleb Melnikov (Saban’s Go Go Power Rangers), along with visionary writer and director Joss Whedon (Buffy the Vampire Slayer, Marvel’s The Avengers). This will be the first Angel release from BOOM! Studios as part of acquiring the comic book and graphic novel publishing license to officially expand the rich mythology created in television, novels and beyond. Meet Angel – a vampire cursed with a soul who has spent centuries protecting humanity from the monsters that lurk in the dark…including himself. Now, looking for redemption for the atrocities committed by the monster he was when he was first turned at the age of 18, Angel stumbles upon a new demon uprising and a shocking truth: The restoration of his humanity can only come if he takes one more life: a certain Slayer from Sunnydale who he’s never met…but may now be his greatest enemy. ANGEL #0 features a main cover and a special one-per-store “Thank You” variant cover, both by Mondo illustrator Boris Pelcer. Bryan Edward Hill is a writer-filmmaker living in Los Angeles, who has previously written comic books including Detective Comics, Batman and The Outsiders andAmerican Carnage for DC Entertainment; Killmonger for Marvel Entertainment; and is currently writing Titans for the DC Universe. “ANGEL is a great opportunity to tell a story about the present, the past, redemption and most importantly…love,” said writer Bryan Edward Hill. Created by visionary writer and director Joss Whedon (Marvel’s The Avengers film franchise), Angel premiered on the WB Network on October 5th, 1999 and was a spin-off from Buffy The Vampire Slayer. The series ran for five seasons from 1999-2004, starring David Boreanaz as “Angel,” the tortured vampire destined to walk the earth with a soul who moved to LA to set up shop as a supernatural private investigator. Despite Angel’s best efforts to deal with the sins of his past all by himself, Angel Investigations soon became home to other lost souls searching for redemption and willing to fight by his side. ANGEL is the newest release from BOOM! Studios’ eponymous imprint, home to critically acclaimed original series, including Once & Future by Kieron Gillen and Dan Mora; Faithless by Brian Azzarello and Maria Llovet; Abbott from Saladin Ahmed and Sami Kivelä; Bury The Lede from Gaby Dunn and Claire Roe; Grass Kings from Matt Kindt and Tyler Jenkins; and Klaus from Grant Morrison and Dan Mora. The imprint also publishes popular licensed properties including Joss Whedon’s Firefly from Greg Pak and Dan McDaid; Buffy The Vampire Slayer from Jordie Bellaire and David Lopez; and Mighty Morphin Power Rangers from Ryan Parrott and Danielle Di Nicuolo.